Once was a dominant prairie grass, Indiangrass reaches 3 to 4 feet high. It forms its dramatic seedheads from September to November. The beautiful golden plume-like seed heads are 4 to 12 inches long on 2 foot stems making this grass part of the tallgrass family. 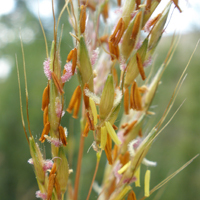 Indiangrass is a lowland species that endures extreme drought. It grows best in sand, loam, and clay moist soils of bottomlands and on lower slopes of hills. Grows in all regions of Texas and Canada to Mexico. Indiangrass is a larval food source for butterflies. Turkeys use for food and cover. Whether you have pots, square feet, acres or sections your property should be evaluated seasonally to decide what should be improved and if more Native plants could be added to create a more diversified environment. Just as humans like a varied diet so does the wildlife we hope to attract. By adding diversity you can make sure that food and habitat are available year round not just in the spring or fall. Each year, as new native species are added, the invitation is issued for more wildlife to visit your property. 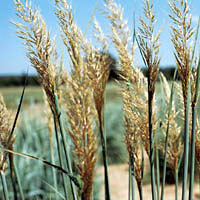 Indiangrass, Sorghastrum nutans, is a perennial bunch grass that provides both cover and food for wildlife, and a valuable range indicator. It is a decreaser, meaning that with heavy grazing pressure it will decline. Only the best managed rangelands have significant stands of this nutritious grass. Indiangrass along with Big Bluestem, Little Bluestem and Switchgrass make up the four major grasses once found in the Tall grass Prairies that covered the central United States. Indiangrass will grow in a variety of soils including sandy and gravely disturbed sites but thrives best in rich bottomland areas with adequate moisture ranging from Canada to Mexico. It will survive periodic flooding but not prolonged saturation and thrives after being burned. 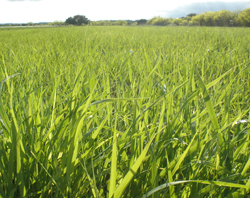 The active growing period for this warm season grass starts in mid-spring, end of March to early May here in Texas. All warm season grasses like for the soil temperatures to be above 50 degrees Fahrenheit before germinating. It also makes a wonderful accent or ornamental grass for home landscaping. The clump will grow to about 1 ft in diameter and the blue green foliage remains about 3-4 ft until the fall when seed heads will shoot up. The plume-like seed heads have a metallic golden sheen sometimes turning a bronze color. These beautiful seed heads mature between Sept-Nov and make a stunning fall accent. This fall let the seed heads of Indiangrass spread across Texas from potted patio containers to the western ranges.